UTStarcom WA3002 -g1 ADSL Modem belongs to BSNL type 2 modem category. BSNL type 2 modem means you can connect your computer to a modem using both Ethernet cable and wireless. WA3002-G4 has inbuilt router feature and you do not need to purchase an extra router to connect and share Internet among multiple devices. 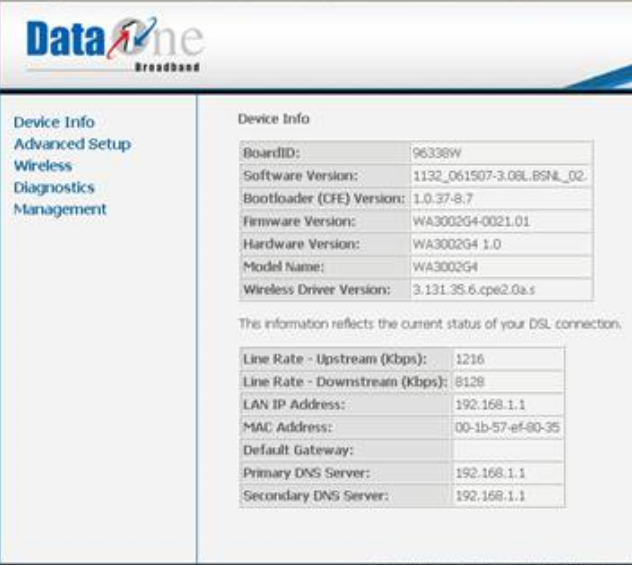 This tutorial explains how to configure Internet access and wireless security on this modem without setup disc. We also discuss how to manage this device including setting WiFi encryption, firmware upgrade, repairing common problems, Opening ports, recovering password etc. Connect the LAN port of WA3002 to the computer using an Ethernet cable and power on it. Login IP address of UTStarcom WA3002is 192.168.1.1. While pressing enter key after entering the IP address on the browser address bar, provide the below information to log in. Now you will see all possible Internet connection settings and you should select PPPoE connection. Unless you want to bridge UTStarcom WA3002 -G1 ADSL, PPPoE is the correct Internet connection method. 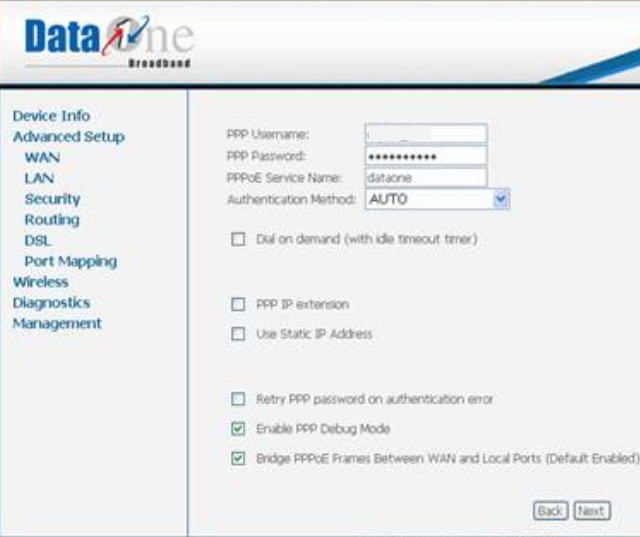 Click on Edit button opposite to the PPPoE and Enter the following details. 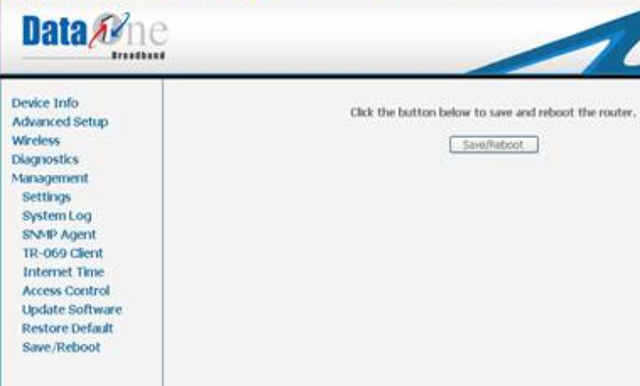 Here you need to enter the BSNL Dataone service Username and password provided by BSNL broadband. If you do not know the username and password, you must contact BSNL Technical department or check the activation email sent by them. Here you should enter the Dataone username and password provided by BSNL. After entering all the details save settings. After finishing the Internet configuration in UTStarcom WA3002 ADSL Type 2 Modem, we need to reboot it. To reboot it, click on Management and click Save/Boot. Wait for a minute and when all the lights are steady, check for the Internet connection. After completing the Internet configuration on UTStarcom modem, we need to set up wireless and WiFi security on it. If you do not configure strong wireless security, anyone can sneak into your network since BSNL type 2 modems by default broadcast wireless signals. Steps to complete this procedure, follow the instructions below. Click on Wireless tab in the left-hand side menu. 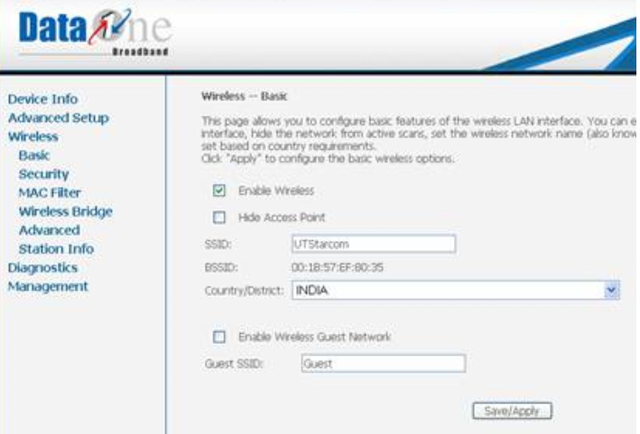 If you do not want to give administrative wireless access to your friends at home, BSNL type 2 modem has the feature guest access to allow a limited feature wireless account for your friends. To enable it to check the checkbox at Enable Wireless Guest Network. You can give a different network name for the guest account created. To enable wireless security on BSNL UTStarcom WA3002 modem click on Security tab under wireless. 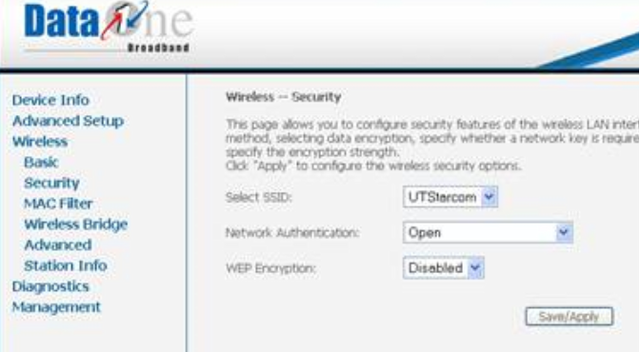 You should select WEP encryption to enable minimum wireless security for UTStarcom WA3002 -G1 ADSL modem. However, WPA and WPA/2 are much better than WEP encryption. Now you need to enter 10 digit alphanumeric characters as a wireless key (0 to 9 and A to F). If you are facing trouble with playing online games on BSNL Internet connection, follow the instructions provided in the link below. In case if you forget the login details of UTStarcom WA3002 modem or you want to erase the current broadband configuration, you can follow the instructions provided in the link below. Both hard reset and software reset for UTStarcom modem are explained in that tutorials. This tab on the right-hand side. To enable WiFi protection on WA3002-G4 BSNL Type 2 modem, click on security under wireless. To select right network encryption click on network authentication. To save changes permanently, go to management and click on Save/Reboot. some time before, i changed my password in the modem settings; but now i forgot it..will resetting the modem help me?? If you forget the BSNL modem password (where default password is admin), you need to reset the modem. There is no way to recover your previous password (password which you forgot). Hi i have BSNL wifi modem WA3002-g1,type2 modem. i want to connect my 2-3 laptops at a time.However,I am able to connect one laptop through lan and other thr'wifi.Both laptops donot run on wifi and also 3rd laptop can not be connected using wifi simultaneously.Please guide. You have BSNL wifi modem WA3002-g1 type 2 modem and 3 laptops. You want to connect 3 laptops at the same time where you have one LAN port on modem. You can share your wireless network and connect 2 other laptops to it. Can this modem be used with MTNL network? Also, I want to connect 2 laptops and one mobile and one iphone 4 such a way that anyone can be used anytime irrespective of other laptop/mobile is switched on or off. Is it possible? In order to clarify whether WA3002 -g1 UTStarcom ADSL modem is compatible with MTNL network, you should contact MTNL tech support. If the modem is compatible with their connection, you can configure this modem according to MTNL modem configuration guide. Seems the specific website is blocked by firewall. Can you access the website "www.jkbankonline.com" though a proxy ? May be this article may help you. Thanks for the interest.When I use my modem in "Bridge mode", all sites open but when using in "PPPoE/LLC mode" the said site not opens.Please suggest me trouble shoot because I have to use PPPoE only. Tor Browser works great even in PPPoE modem mode.But I am in doubt,is it safe to lonin banking sites through Tor browser.Please clarify. Can it made possible to open all sites in PPPOE/LLc mode but not in Bridge mode ? So that I am not forced to choose Tor Browser. Tor is a reputed proxy but I recommend you to go banking websites directly (without any proxy). Since you have performed most steps provided on my article, I suggest you to try one workaround found in the web. Check the step and let me know. Dear Alex,thanks for further step. Seems you have tried most of the workarounds and the issue persists. What message you get while trying to access "www.jkbankonline.com" ? Since you can access the website when the modem is bridged, you cannot blame the ISP firewall too. Dear Alex would you please guide me to perform port forwarding on NAT or make your computer as DMZ. (Microsoft.com and jkbank.com were not opening through my WA3002 g1 modem if it configures in PPPoE/LLC mode, but the said sites opening if Modem is in Bridge mode. The host you've chosen does not accept ICMP Pings, please chose a different one." Now the question is that how to configure my modem in PPPoE/LLC mode so that the modem uses other ping rather than ICMP Ping ? because the sites which have restricted ICMP ping are not opening through my modem. I too get request timed out when I ping microsoft.com from my computer. Many discussion forums have this question and the conclusion is that microsoft.com is not responding to ICMP requests. If one particular website is configured not to respond ICMP requests, it doesn't mean you cannot access that website though your modem. For your specific issue, I recommend you to contact BSNL technical support and I am sure they can help you to resolve the issue. For port forwarding in BSNL modem, visit the link below. Have you disabled the firewall on BSNL modem and checked the issue ? but the result is negative. Perhaps by converting your computer as DMZ host, you may be able to fix this issue. This tutorial will help you. I suggest you to ping the modem IP address and check the result. Type ping 192.168.1.1 on DOS prompt. I suggest you to follow the steps provided in the link below. I recommend you to reset your modem and reconfigure it.